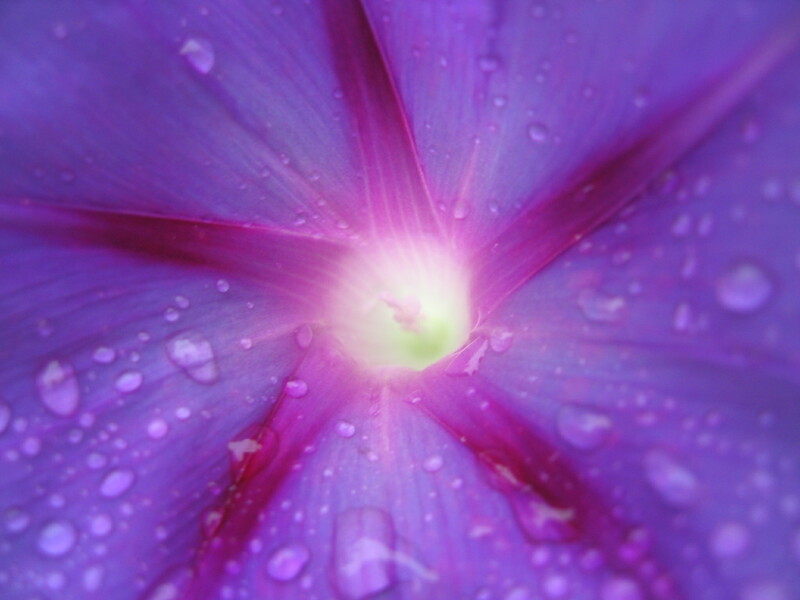 Morning glories are like New Year's fireworks. New Years marks a time to begin again, to start anew in the practice to be the best version of ourselves. Rather than making a resolution, which is rigid and guilt-provoking, make a goal as an intention of creating transformation through a practice of self-reflection. Incorporating a practice of mindfulness meditation, contemplative prayer, journaling, or walking builds a perspective of our life that allows us to observe tendencies to revert to earlier habits of behavior and mind. When we have a practice of reflection, we develop an attention to how our whole mind-body-spirit responds to life. We notice the craving-causing triggers that elicit strong emotions. Developing the inner observer, or mindsight, creates the foundation for consciously choosing thoughts and behaviors that make a goal a reality. When we’re at the edge of our comfort level, cultivating awareness of impulsive or rigid patterns of thoughts and behaviors in order to choose a new way of being, we’re in beginner’s mind. What’s great about being in the powerful space of beginner’s mind is that it is safe and forgiving, mistakes are allowed and practice is encouraged. No one expects a T-ball player to bat like he’s a pro. If, however, the T-ball player chooses never to attempt to swing at a pitched ball, he’ll remain at the level of his comfort, and never be a pro. That’s fine if that’s what he wants, but if he wants to see what else he is capable of, then he will need to become a beginner again as he swings at thrown pitches. As the saying goes, “If you always do what you’ve always done, then you’ll always have what you’ve always had.” A courage-building spin is, “To have what you’ve never had before, you’ve got to do what you’ve never done before.” We can courageously choose change with a beginner’s mind. At the brain level of beginner’s mind we are forming new neuronal pathways, and by not doing what we are patterned to do, we are pruning existing neurons. Our habits are well-worn pathways of firing neurons. In neurobiology, there’s a saying, “Things that fire together, wire together.” If we eat when we’re upset, then we will, by neuron association, crave food when we’re upset. When we have an awareness of the upset when it happens, we can expand the space between the trigger and the programmed reaction, allowing us to observe the phenomenon and have more time to choose a response in alignment with our goal. In the process, we are literally changing the structure and function of the brain cells in our head. With practice, the new neurons become well-worn pathways, and a new habit of mind is developed. The common phenomenon of starting a diet on January 2nd and forgetting it by January 3rd happens because the weight goal lacks a grounding foundation in conscious intention. Centering the weight-loss goal in the context of a process of personal growth with a reflection practice, called intentional eating or mindful eating, rather than mindless eating, is a more sustainable diet program. Why can’t we just finally fix ourselves for good? Why does change have to be so hard? Change is a process which adjusts to life situations. If we were fixed, we’d lose the ability to adapt. So, when you feel balanced one moment and later feel off track, remember your reflection practice, and that we can always begin again. Wishing you the highest & best for 2012! the utube just talkes about pilsbury ideas but…………. I love the idea about mind set and change, its true and a wonderful to contimplate. Walks mean so much to me and the botanical garden I never get tired of that place always new growth. Right now everyone is sleeping for the spring and that has its beauty too. Thank you for those good thoughts. Thanks for this great insight Holli. I’ll try and put some of this in to practice.